In the next few weeks there are going to be so many Lincoln updates that you’ll be pining for the good old days when nothing happened other than the occasional Liam Neeson visit to Springfield. As is his custom, Daniel Day-Lewis was fanatically committed to his role in Spielberg’s upcoming Lincoln film. This according to Joseph Gordon-Levitt, who plays Robert Todd Lincoln and whose character in The Dark Knight Rises was utterly superfluous, thank you very much. There’s already been misplaced criticism of Day-Lewis’s portrayal of Lincoln’s voice. All you people who want your Lincoln to sound like Gregory Peck need to read up on what his voice was actually like. Among the stories told was one about a re-enactor who was re-enacting a battle at one point and thought he had been “killed” by another re-enactor. 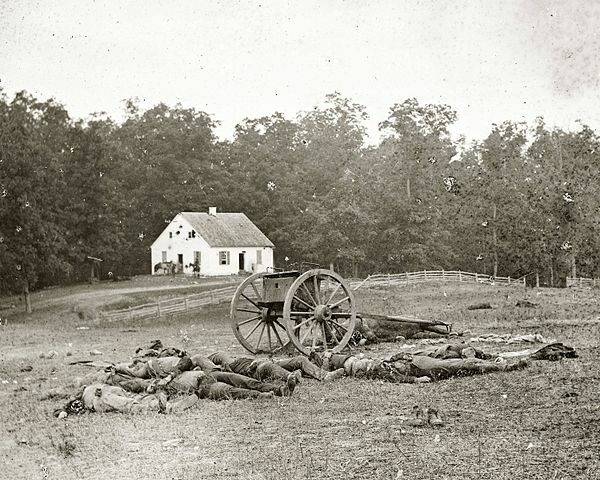 However, after the battle was over, nobody else saw the “killing” re-enactor, and Riley implied it was the spirit of an actual dead soldier who took part in the battle re-enactment, thinking it was real. Remember that painting of Rev War militia officer Benjamin Cleveland that Don Troiani was working on? It’s done! The Wilkes Heritage Museum has a copy, and you can get a look at it by clicking here. That Lincoln document that a guy has been hawking on the street in Milwaukee? It’s probably a facsimile. The original is still at the Library of Congress. If you can’t put your faith in a presidential manuscript that somebody’s peddling by the road with a handmade sign, then you can’t really take anything for granted, can you? If you drive along U.S. Route 58 in Lee County, VA you might notice a distinctive geologic feature a few miles east of the entrance to Wilderness Road State Park and just inside the eastern boundary of Cumberland Gap National Historical Park. 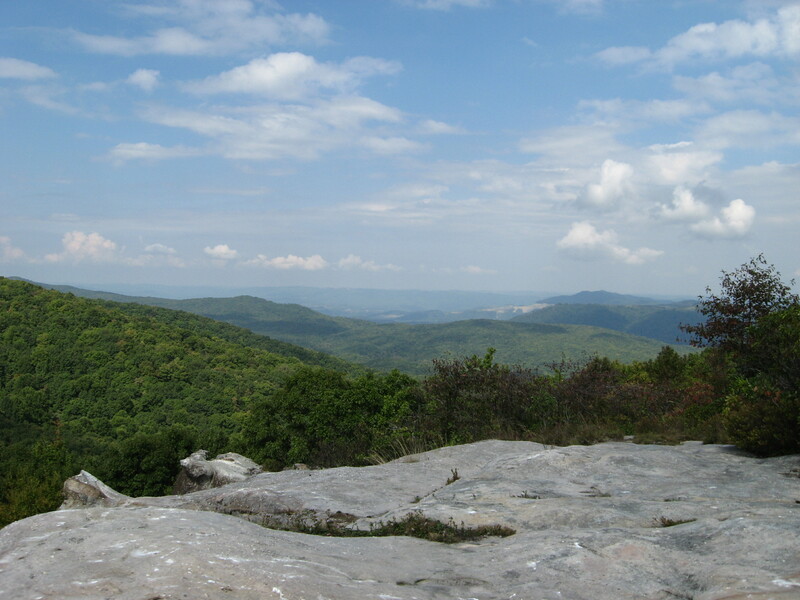 Atop the ridge of Cumberland Mountain sit the “White Rocks,” a sandstone formation containing light-colored quartzite that shines when the sun hits it. I doubt any of those frontier migrants felt like climbing to the top of the ridge to see what the valley looked like from the rocks; they had more important things on their minds. 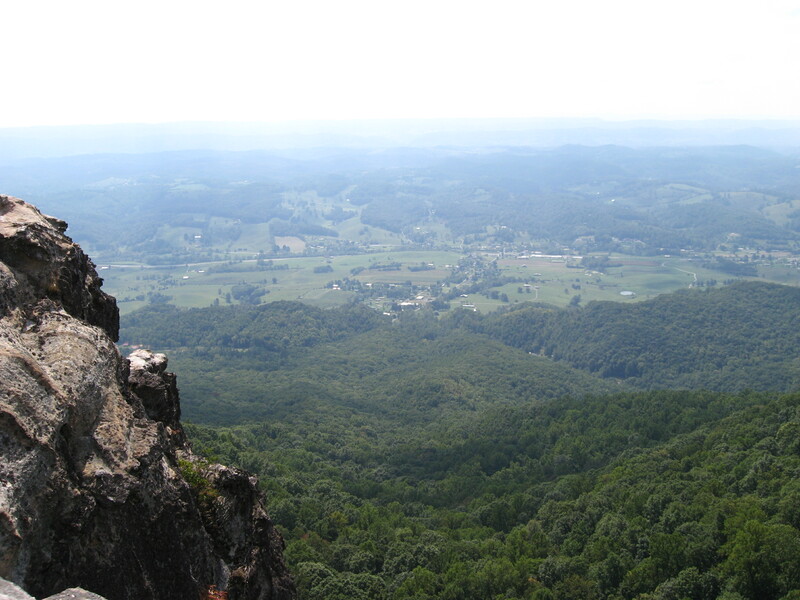 Today, though, if you want to check out the view from White Rocks, there’s a three-mile trail that will take you there. That’s three miles one way, mind you, and it’s mostly uphill. Not exactly easy, but you can take in some nice scenery once you get there. Sort of a bird’s-eye view of Daniel Boone country. 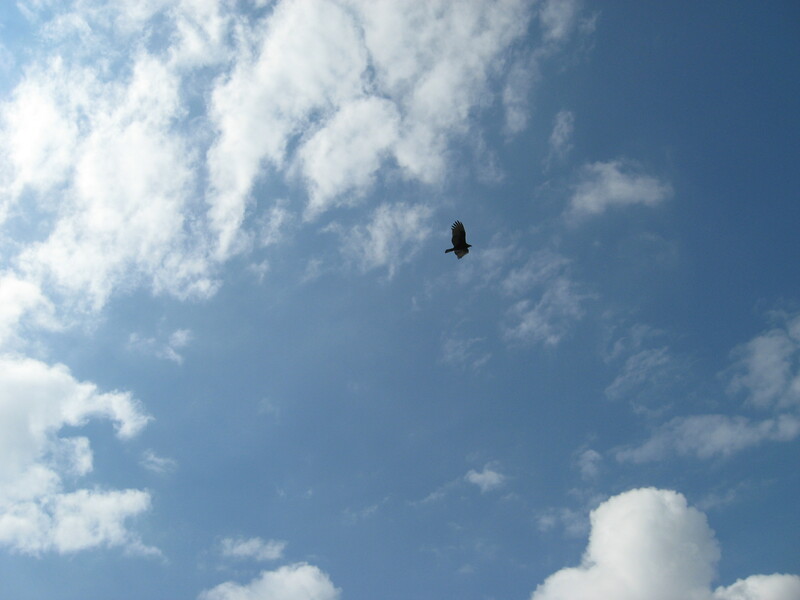 Actually, I guess it is a bird’s-eye view, since you’re eye-level with the birds. 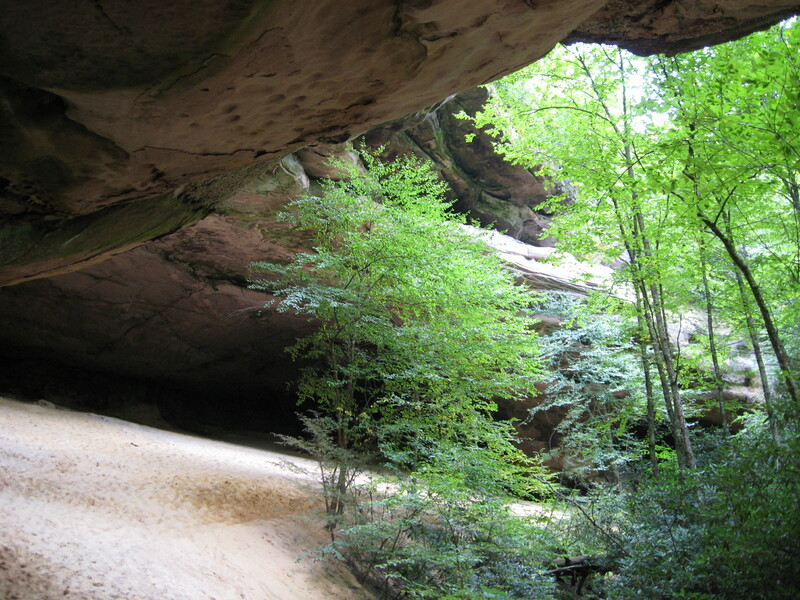 If you’re going to hike to White Rocks, make sure you see Sand Cave, too. 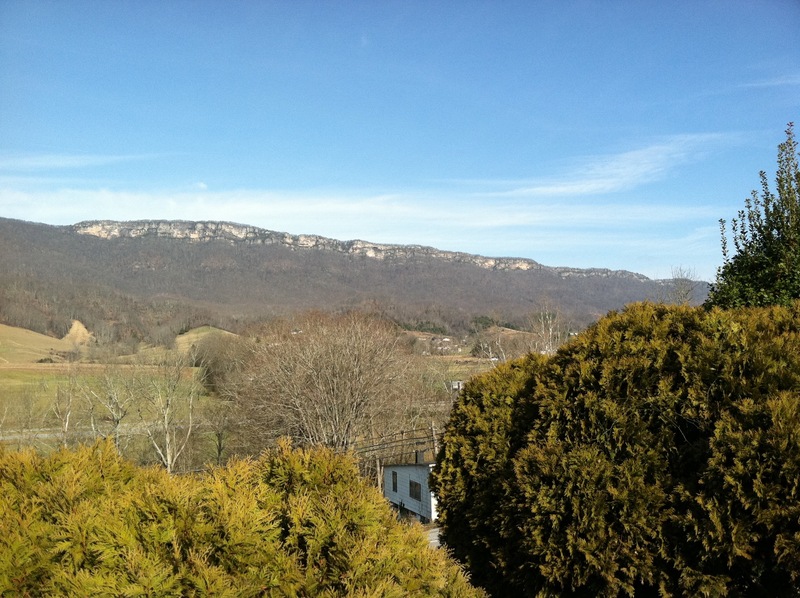 It’s about a mile from the White Rocks overlook, and on the other side of the ridge. I’d never been there before last week, but as soon as I saw it, it immediately became one of my favorite places in Cumberland Gap National Historical Park. 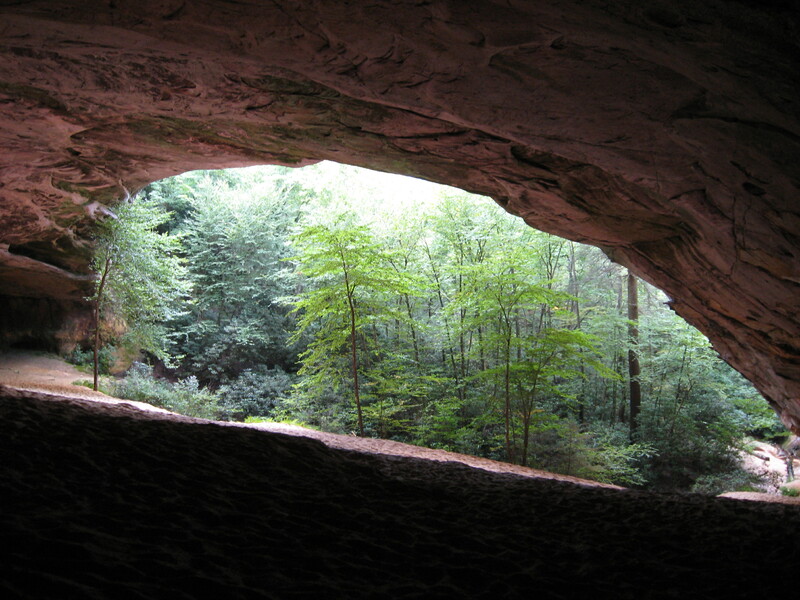 The cave gets its name from the fine sand that covers the floor. There’s a small waterfall near the cave’s entrance. My pictures don’t really do it justice; with the waterfall-fed stream running through the trees and the cave’s ceiling towering overhead, it’s like stumbling across the Garden of Eden. It’s not a deep cave, but the semi-circular roof towering overhead and the wide entrance make it pretty spectacular. The sand inside is so thick that it’s like walking on a beach, with your feet sliding and churning all over the place. Here’s a golden opportunity for all you Lincoln buffs in the Milwaukee area. For a few weeks now, Ron [Barczynski] has been sitting there at 27th and Cleveland for hours a day trying to find a buyer for what he insists is an original and authentic letter from one of our greatest presidents to a Civil War hero. “I want $10,000. It’s a bargain,” he tells me when I stop to ask what the heck he’s up to. Other Lincoln documents have gone for 10 times that amount, he says. …I can’t help but think this would be a sound investment. Today wasn’t just the 150th anniversary of the Battle of Antietam; it was also the 225th anniversary of the signing of the Constitution. Wonder if all the guys who labored over that piece of parchment had any idea how expensive it would turn out to be.